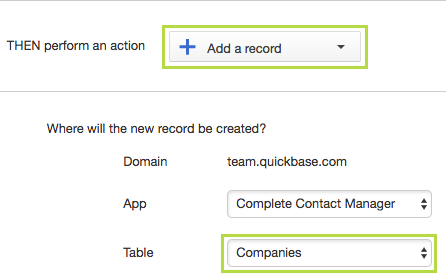 If you're an app admin, you can use Quick Base actions to automatically add records or edit related records in a Quick Base table when data is added, modified, or deleted. No coding required – just choose when, what, and where from options in a dropdown list. For example, you might want to create a Quick Base action that automatically adds a record to the Customers table when the status of an Opportunity changes from Open to Won. Or if you are tracking Projects and Tasks, and the priority of a Project changes to High, you might want Quick Base to automatically edit related records by setting the priority of related Tasks to High as well. Copying the old value from a field in the changed record to a field in the target table. The old value is the value before the change that triggered the Quick Base action. This option is available only when a record is modified. Writing the value from a field in the changed record to the field in the target table. Writing the value can include static text, the value of one or more fields, or other information, such as the name of the app or table. Open table Settings, click Quick Base actions, and select New action. Select when you want Quick Base to perform an action. 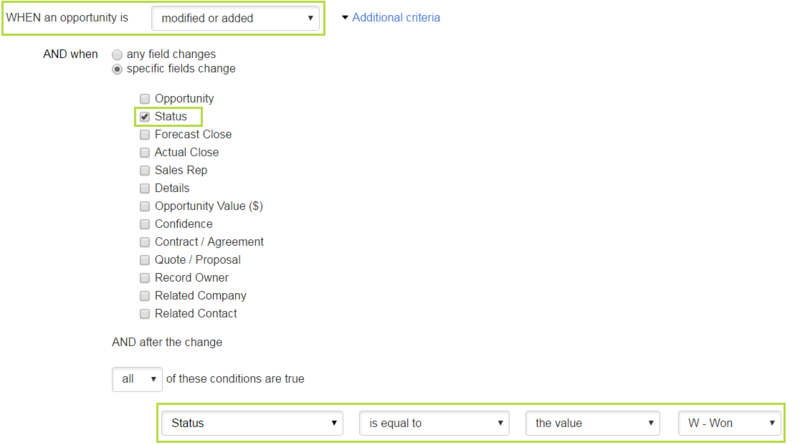 In this case, When the status of an opportunity in the Contacts table changes to Won. Then, tell Quick Base the action to perform. In this example, add a record to the Companies table. You can choose a table in any app in the same realm, as long as you have permission to add a record in the table. Now tell Quick Base what fields you want to add or modify. In this case, Quick Base will automatically create a new record and copy the value in Contact Full Name field from the changed record in the Contacts table into the Customer Name field in the Companies table. You can also use Quick Base actions to edit related records. Related records are any records referenced by a report link, either as part of a parent-child relationship or custom report links. For example, if you are tracking Projects and Tasks, and the Priority of a project changes to High, you might want Quick Base to automatically set the priority of the related Tasks to High as well. In this case, the value from the Priority field in the Projects table (High) is automatically copied to the related Tasks. This change could trigger notifications, if they were set on the tasks' priority changing. Only app admins can create and modify Quick Base actions. A Quick Base action runs using the permissions of the app admin who configured the action. For example, if you set up an add record action, you will be listed as the owner of the records that are added. As you create or modify your Quick Base action, you will only see tables and fields to which you have the appropriate permissions. If you modify and save a Quick Base action, you become the owner of the action and it will subsequently run with your permission.